The Dubai Looped Sapphire Demi-Parure has multiple large sapphires with enough carat wattage to earn a place on my list of The Queen’s top sapphires alone. It’s also a handy little representative for the impressive amounts of jewelry Her Majesty has been given over the course of her reign – and for the ways in which she deals with those jewels. 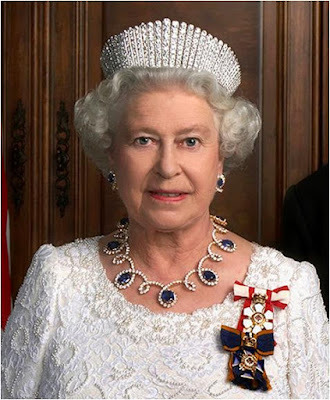 Sheikh Rashid of Dubai gifted this diamond and sapphire set to The Queen during her 1979 Middle East tour. It originally included a necklace, earrings, and a ring. And here’s where we learn about how she handles these things: she wore the pieces as they were originally given first, and after a period of time, she altered the set to suit her own tastes. The necklace was shortened (as she often does with necklaces), the extra links made smaller earrings, and the ring and original earrings (all larger than what she normally wears) made a bracelet. She turned the set into something she could comfortably wear more often while still respecting its origins, and she’s delighted in these big sapphires ever since.